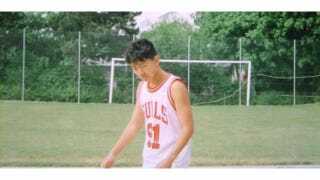 This is a photo of a young Kim Jong Un wearing a Dennis Rodman jersey. This is a photo of a young Kim Jong Un wearing a Dennis Rodman jersey. They'll be fast friends.